RULES ARE MADE TO BE BROKEN - Oliver (Stephen Amell) makes a drastic move in his quest to find Diaz (Kirk Acevedo). Like her husband, Felicity (Emily Bett Rickards) pulls out all the stops to get to Diaz. 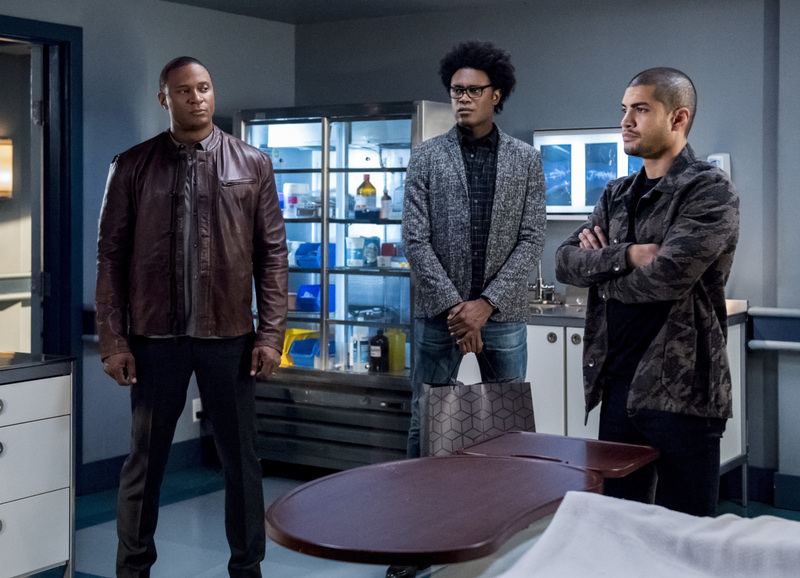 Meanwhile, when arsonists target Rene's (Rick Gonzalez) community center, injuring Zoe (guest star Eliza Faria) in the process, the mysterious new Green Arrow swoops in to help save the day. Faced with pressure from the mayor to capture the vigilante, Dinah (Juliana Harkavy) must decide if following the rules at all costs is the best plan to keep the city safe. Ben Bray directed the episode written by Emilio Ortega Aldrich & Tonya Kong (#704). Original airdate 11/5/2018. The flash forwards are the only thing saving this season so far. Future timeline is better than current timeline. Can we move the show 10yrs into the future permanently? That may be what they're working towards if the show were to continue. Did anyone notice it looked like future Diana had surgery to remove her powers? Surgery or somebody decided to try and make the decision for her? I have been skipping any scene that involves the prison or Felicity this season. I haven't been impressed by the writing for this new season at all. The new producers have been a step down in quality. This Oliver-in-prison scenario was a test to see if Arrow could function without Amell on the show. It's been a miserable failure in that regard. The CW is nuts if they bring Arrow back next year without Amell. It looks like they're making a move to set it in the future with future William as the new GA. The only thing is if they set it in the future it would make crossovers difficult. I think the show is done if Amell leaves. The CW has almost certainly already green-lit a Batwoman series as Arrow's replacement. This season with a reduced Green Arrow presence is a test run for the Batwoman show. I'll probably skip Batwoman if it's going to be what I think. I already dropped Supergirl. Black Lightning is pretty good tho. I'm hoping that the CW doesn't get a Superman show.